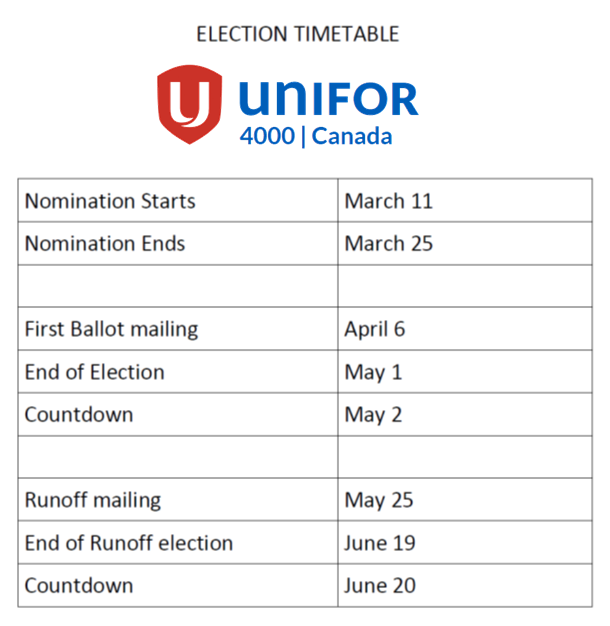 Nominations are now open for the position of Unifor National Council 4000 Secretary Treasurer and positions of Regional Representatives. These are full-time positions that are elected to three (3) year terms commencing on July 1, 2015. As in accordance the Bylaws of National Council 4000, the period for nomination is fourteen (14) calendar days from the date of posting nominations, which is March 11, 2015. The position of Secretary Treasurer is a full time position with Unifor Council 4000. Wages are as described under Article 6, Section 3 of the Council 4000 Bylaws. Benefits are paid to the employer that you are employed with so you maintain your existing benefit plan. Expenses are paid in accordance Article 6, Section 5 of the Council 4000 Bylaws. Vacation is based on your present vacation entitlement with your employer. In the case of members who are employed as contractors, vacation time is as described in Article 6, Section 4 of the Council 4000 Bylaws. This position is open to all members in good standing of Unifor Council 4000 across Canada. Applicants to the position of Secretary Treasurer should have experience with Microsoft Word and Excel, as well accounting software used for administering expenses and payroll for the Council. Applicants must have the ability to work under time sensitive constraints. Travel is a requirement, so applicants must be able to spend durations away from home. Previous experience as a Local Union Financial Treasurer or Trustee is an asset, as is prior experience as either a Regional Representative, Local Union President, Local Chairperson or Grievance Officer with the Union. Members who contemplate standing for this position should do so with confidence in their abilities to perform the required duties and take on the important responsibilities that come with this job. The position of Regional Representative is a full time position with Unifor Council 4000. Wages are as described under Article 6, Section 3 of the Council 4000 Bylaws. Benefits are paid to the employer that you are employed with so you maintain your existing benefit plan. Expenses are paid in accordance Article 6, Section 5 of the Council 4000 Bylaws. Vacation is based on your present vacation entitlement with your employer. In the case of members who are employed as contractors, vacation time is as described in Article 6, Section 4 of the Council 4000 Bylaws. These positions are open to members in good standing whom are members of the applicable Regional Local Union and who are employed with the employers that the position services. Applicants to the position of Regional Representative should have experience with Microsoft Word and Excel. Applicants should have an understanding of the Canada Labour Code and any applicable Provincial Labour Codes. Applicants must have the ability to work under time sensitive constraints. Travel is a requirement, so applicants must be able to spend durations away from home. Previous experience as a Regional Representative, Local Union President, Local Chairperson or Grievance Officer is an asset. The elected member starts work on the position effective July 1, 2015.